A rendering shows what Roosevelt Avenue could look like under a proposed BID, but some business owners say the cost may push them out. JACKSON HEIGHTS — A new merchant group made up of immigrant business owners is fighting back against a proposed business improvement district, saying the move will push them out of the neighborhood. The Roosevelt Avenue Community Alliance rallied Sunday against the proposed Jackson Heights/Corona BID, which they say will replace family-owned immigrant businesses with large chains that can afford the fees used to provide services. The group also said those in charge of the BID haven't done proper outreach. But those in favor of the BID say it's designed to help maintain the small businesses and strengthen them against large-scale development nearby. Plans for the BID were unveiled in June by the 82nd Street Partnership and Councilwoman Julissa Ferreras. This summer, additional street cleaners were sent along Roosevelt Avenue and Junction Boulevard, part of a "Taste of the BID" initiative that gave a preview of what a future business improvement district could offer. Ferreras, who's made the BID part of her "New Deal" campaign for Roosevelt Avenue, defended the plan, saying it will help fund necessary improvements for the area. "By working side-by-side with our local community boards and city agencies, the proposed Jackson Heights-Corona Business Improvement District will work to ensure the well-being of our community through the provision of critical resources to our small business owners," she said in a statement. 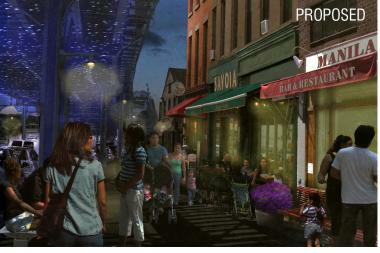 Those improvements include graffiti removal, additional trash bins and brighter street lights. Seth Taylor, the director of the 82nd Street Partnership, said the plan is "100 percent about supporting and strengthening the small business community in the neighborhood." The cost for each business in the BID will be calculated based on a combination of the property's storefront size and assessed value, which is determined by the Department of Finance. After a district plan is finalized, it will be voted on by business owners, residents and property owners. If it passes, it will be finalized by 2014.